It should not come as a surprise to anyone that deployment and maintenance of data centers is not exactly a money-friendly process. Not by a long shot. The purchase of the requisite equipment and software license alone is a long-term investment, not to mention the costs related to power usage. Yes, power usage – probably the most pricey recurring expense of all. Colocation is usually made up of numerous devices running 24/7 so as to provide the users with round-the-clock access. You do not need to be a Maths genius to figure out that the more devices assigned to the colocation → the higher the power consumption rate → the bigger the costs. But that is not all. When we take into account the fact that some larger metropolitan areas and remote places have considerably higher cost of electricity than other locations, we might end up with really cosmic numbers. Looks like power usage is quite a big deal when it comes to company’s profitability, isn’t it? So, how to reduce the power consumption of data center devices to the absolute minimum? One of the most common solutions used by modern data centers is replacing the standard power strips that possess few or no energy-saving features with Power Distribution Units. PDUs are far more advanced, enabling the measurement of electrical parameters, load switching, and monitoring of environmental factors such as temperature or humidity. And why is all of this so important anyway? Because, most of all, insight into the exact conditions inside a rack cabinet along with immediate reports of any encountered errors empower administrators as well as data center operators to address them and implement various measures increasing energy efficiency promptly. Although very much alike the ordinary power strips, the role of PDU devices does not end with distributing electric power only. As we already mentioned, PDUs first and foremost measure electrical parameters, but they can also be used to switch on and off the installed outlets and monitor them remotely via network interfaces. After all the good stuff you have heard about Power Distribution Units, you might think that hardly anyone will be able to afford such a space-age solution for their data center. But the truth is that PDU devices are actually becoming increasingly more widespread as the pressure from data center operators and server rooms to reduce energy consumption intensifies. PDUs of different manufacturers can collect various measurement data, but there are several common elements: frequency, voltage, current and their product – power. Depending on the class, PDU devices can also measure active and apparent power – two other key factors when using power supplies with capacitive and inductive load characteristics. EasyDCIM v1.4.3 supports PDU devices of APC and Raritan brands. Data on the status of power outlets, power consumption and current PDU load are downloaded cyclically in five minute intervals, using the SNMP protocol. This protocol also allows a remote control over power devices, which makes it possible for you to start, shut down, or restart any outlet in a fully remote manner, simply sending corresponding commands from the EasyDCIM panel. Each colocation can be assigned an unlimited number of PDU outlets. You can see the list of all active power devices assigned to the given colocation by moving from the colocation summary view to the ‘Power’ subsection. When assigning a new device to the colocation, you are additionally offered the choice of available power outlets. You can select all, or just the preferred ones. Either way, all power devices you have picked will be listed in the ‘Power Ports’ section of the given colocation. Assigning an outlet to colocation will also empower end clients to manage this device remotely, using the ‘switch-on’, ‘switch-off’ and ‘restart’ options. 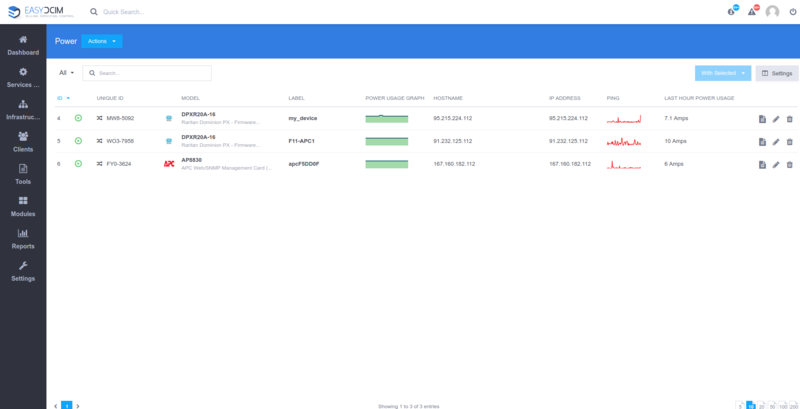 The colocation owner can configure the whole process from a special section in the EasyDCIM client area. EasyDCIM aggregates power consumption based on all PDU devices belonging to the colocation. By way of example: having two assigned PDU outlets which generate different usage, the total consumption for the colocation will be the sum of power from these two devices. 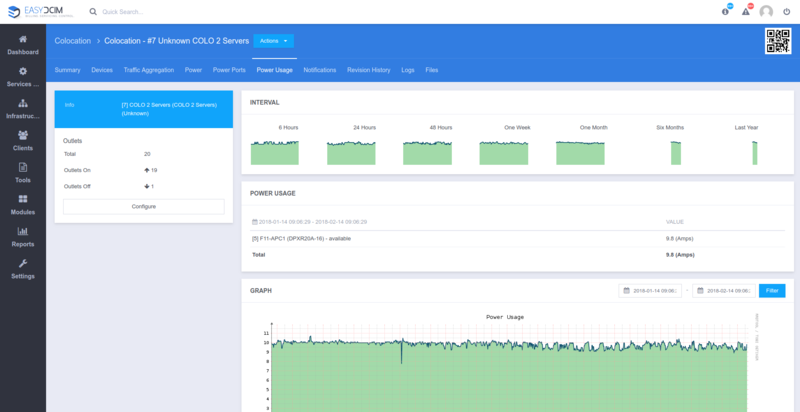 Using the appropriate billing system like WHMCS and EasyDCIM Colocation For WHMCS module, the administrator can then charge customers based on their total energy consumption measured in amps. 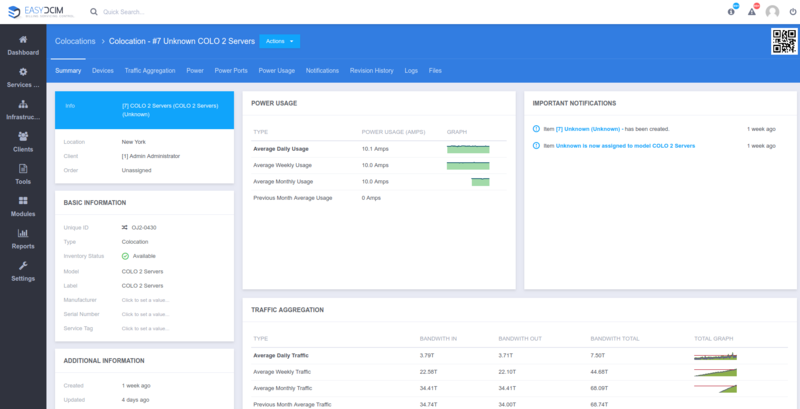 It is also possible to preview past and current power usage for the entire colocation or each PDU device separately in the ‘Power Usage’ section. As you can see, adding PDU devices to colocation and managing their fundamental properties in EasyDCIM is as straightforward as it is beneficial to any data center provider. Put it to practice yourself, and stay tuned for more gripping news on colocation in EasyDCIM v1.4.3! Are you a newcomer to EasyDCIM v1.4.3 and wondering what is going on with this whole colocation thing? Get clued in right away and read more on colocation basics & traffic aggregation as well!